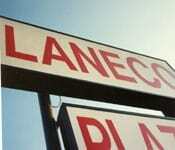 Laneco was a former supermarkey chain founded in 1946 by Ray Bartolacci Sr. in Easton, Pennsylvania. In October 1992 the stores where acquired by Supervalu and were eventually closed by them in 2001. Most stores where converted to Giants and the others were converted to Wall Mart.